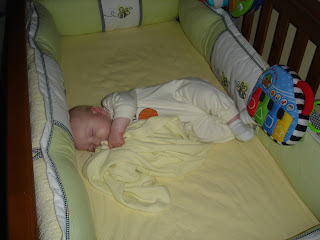 I looked so cute in my crib this morning that Mommy and Daddy had to take a picture of me. Holding my blanket (just like Mommy does) with my legs crossed. It doesn't get any cuter than that. I did this just to make Mommy forgive me for my episode Friday night. Little did I know at this point that I was only two hours away from getting stuck with three needles for my four month shots! If I had known, I would have tried to be way less cute looking! At the doctor today I was 27" (Tall!!!) and 17 lbs 11 oz (Wide!!!) 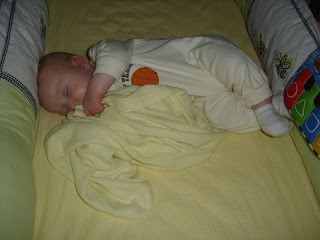 I am in the 97th percentile in both height and weight. I am a big boy! The doctor told Mommy and Daddy that I can start eating food. I can't wait! Neither can they! We will start with some rice cereal tomorrow. In about four weeks we move on to vegetables, and then fruits after that. LOVE IT!!!! Mason looks just like Mommy with her blanky...Kiss Kiss Mason!!!!! We agree with Rachel, we need an update.